A delightful and quirky stand-alone chalet, ideal for a romantic break “a deux” or a family ski trip. Chalet Greniette is an original extended “mazot”, (traditional garden chalets for Savoyarde farmhouses), which has been modernised and converted into a cute little home-from home! Accommodation is spread out over three floors (see the floor plan in the photo gallery); there is parking right outside. On the ground floor is a twin bedroom and a funky white, black and silver bathroom with freestanding claw-foot bath and separate shower, and WC. Up the first circular staircase is the living space: a comfortable lounge with sofa and armchairs, a wood-burning stove and TV / DVD player, with double doors out onto a flat balcony (no railings, not suitable for small children). Next to the lounge is the modern kitchen, with dining table and chairs (the owners are keen cooks and have fitted the kitchen with everything you could need!) Adjacent to the kitchen is a large terrace, with balcony furniture in the summer season, and steps down to the parking area. Up a second circular staircase from the lounge, cosily nestling under the eaves of the roof, is the double bedroom, featuring the original ‘mazot’ arched wooden door, with a high-mounted bed and a WC and handbasin next door. Chalet Greniette is situated a 10-minute walk from the centre of Morzine and the SuperMorzine telecabine. Also, there is a free shuttle bus stop 2 mins walk away in front of the Ridge hotel, which can take you up to the Ardent bubble (for quick access to Les Lindarets and the rest of the Portes du Soleil) in 15 minutes. You can also walk to the Vival mini-market and boulangerie in Montriond in 10 minutes. Montriond also has a friendly bistro-bar, the Marmotte d'Or (sometimes with live music) and Le Rocher restaurant / pizzeria. The address is 48 Passage du Nant Derriere, 74110 Montriond, at [46.190512, 6.701019] map Ref on Google maps (check out the chalet in Google street view). 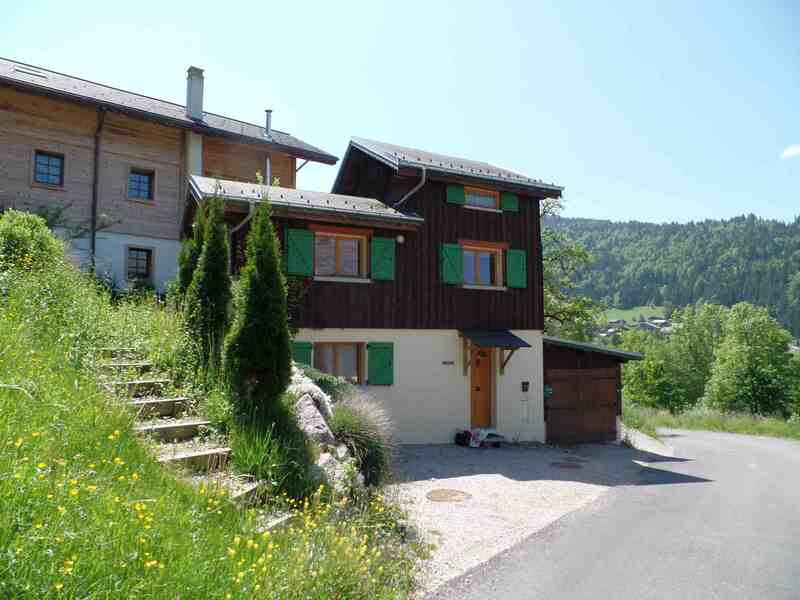 This chalet has a Sunday changeover, except for summer dates, when we can be more flexible. We are also able to offer non-standard arrival days and short breaks in low season.